Google+ is already a huge success. It is clear from the fact that over 10 million users have already joined Google+. Users are so crazy about this new social network that they are requesting for invitations on every single blog. Not only the users but developers are also concentrating more on developing new applications dedicated to Google plus these days. Although Google+ has some cool new features it is still missing some features and one among those missing features is the advanced search option. We have already seen different ways to shorten Google plus profile URL. Now I found two new sites that let you find people on Google plus. 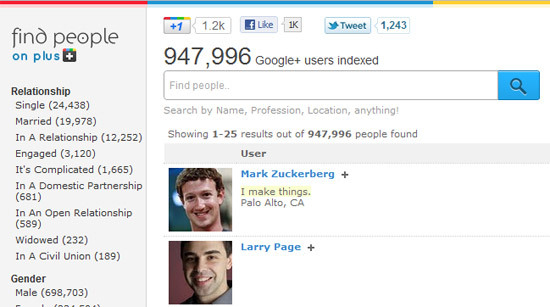 Find People on Plus is a directory of Google+ users. It allows you to find different people on Google plus. You can find other users by Relationship, Gender, Looking for, Following, Followers, Occupation, On Twitter, On Facebook, Country, State and City. It does more than just finding people. It also shows you how many people are following a specific user and that specific user is following how many users. On the sidebar you can find Most followed users on Google+. 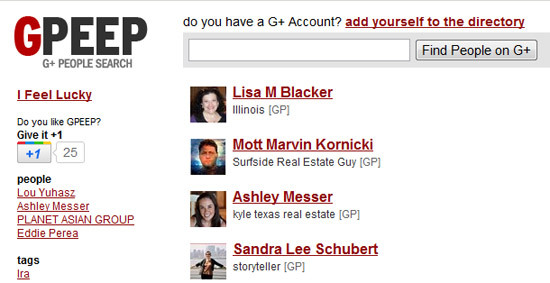 Like FindPeopleOnPlus, GPeep is also a directory of Google+ users. Unlike the above mentioned site, GPeep has an auto suggest feature. When you start typing in the search box, it will give you the results instantly in the sidebar. It only finds people on Google Plus but it don’t show most followed or most popular users. These seems to be nice websites for finding Google+ users. However, I feel these may get redundant once Google+ refines its own search functionality. Its really going to reach top level. Google+ is the “next big thing” now,thanks for this useful post!